Skeletoon can trace their roots back to a Helloween cover band called Jack-o’-Lantern that was active from 2007 to 2011. Singer Tomi Fooler went on to form Skeletoon. ‘They Never Say Die’ is described as the third of five chapters in the band’s “Nerd Saga”. Their first album, ‘The Curse Of The Avenger’, was released in 2016, and the second chapter ‘Ticking Clock’ was released the following year and featured guest appearances from Roland Grapow (Helloween, Masterplan etc), Dennis Ward (Unisonic) and Piet Sielck (Iron Savior). 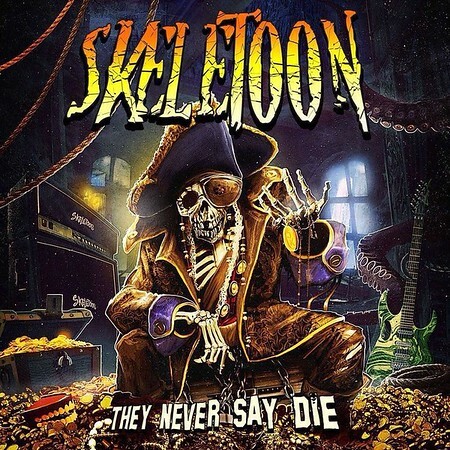 Skeletoon are Tomi Fooler on vocals, Andrea Cappellari and Davide ‘Lord Dave’ Piletto on guitars, Henry ‘Sydoz’ Sidoti on drums and Jack Stiaccini on bass. Special guests on the new album include Michele Luppi (Whitesnake), Giacomo Voli (Rhapsody Of Fire), and Alessandro Conti (Trick Or Treat).